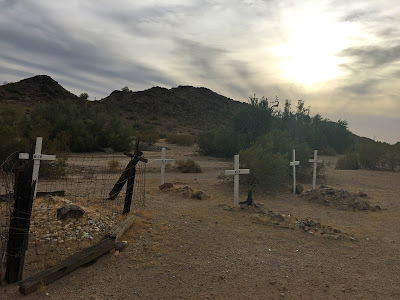 A few days ago I rode along with a friend of mine, who is a volunteer of the Pioneers' Cemetery Association, to go take a look at the Shawmut Cemetery. The Pioneers' Cemetery Association, which accepts donations, and needs new members by the way, helps to preserve, protect, and record the condition of cemeteries all over Arizona. It's been my privilege to see some of these cemeteries, and many are very small, very old, and in very rough condition, but I had never imagined anything like Shawmut. To put it bluntly, it's underwhelming. There are five (5) mounds there, with rocks on top of them. If there were ever any markers there, during the burials between 1900 and 1940 (sorry, I can't be more precise than that, there are no records), they are long gone. The crosses that you see there, especially the white painted ones, are modern. I wish I could tell you more about the community of Shawmut, or even where the name came from, but I can't. My "Arizona Place Names" book from 1935 has no mention of it, which makes me think that it may have been gone by then. Or maybe it just wasn't worth mentioning, I don't know. My railroad history friends have explained to me that it was just like a lot of other little communities along the railroad tracks, back before diesel engines, when trains needed a little community every few miles. What kind of a community was there I can't say, whether there were even any permanent structures. There's nothing left of Shawmut except a name on a map and the five graves. Finding this cemetery took some doing, and a lot of walking, and I promised my friend not to reveal its exact location, except of course that it's near Shawmut, which you can find on Google maps. 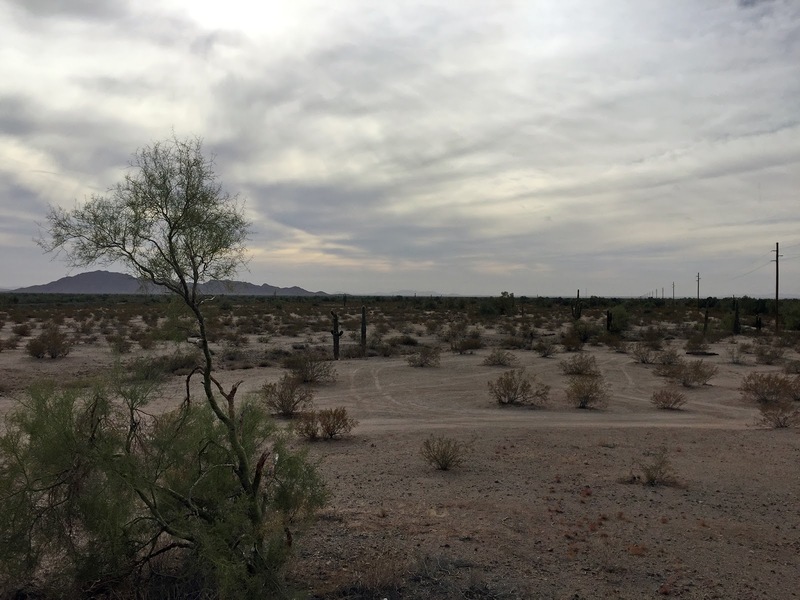 It's in the Sonoran Desert National Monument, which is protected, so hopefully the former residences of Shawmut will always continue to rest in peace. The Sonoran Desert National Monument, which is south of Phoenix, is open to hiking, and even if you don't visit Shawmut, I recommend going there. Take some water and a camera, and of course take only photos and leave only footprints. I assume whoever established the "town" was from around Boston. That's a very common business name around Boston; there was even the Shawmut Bank, a large regional bank that was absorbed and reabsorbed into even larger banks. It derives from the Algonquin word for the Boston area. There are dozens upon dozens of businesses and community organizations with the name all around Boston. I found this page when someone in my hiking group mentioned a hike to "Shawmut AZ". I was really curious how a place in Arizona could be named Shawmut. Thanks for the info! I had no idea (I'm from Minneapolis) and no one else I've talked to has had a clue about it. Let me know if you find out any more! I am part of a hiking group in Maricopa Az that has visited Shawmut several times. There is an article online (https://hikearizona.com/decoder.php?ZTN=957) that explains that the community began as the home to "pusher" cars that pushed the early locomotives over a hilly area near the city o Gila Bend. That's all I know about Shawmut. The graves could be of early settlers or they could be native American. The bodies appear to have been buried above ground and then covered with rocks. Nearby Indian communities buried their dead this way.